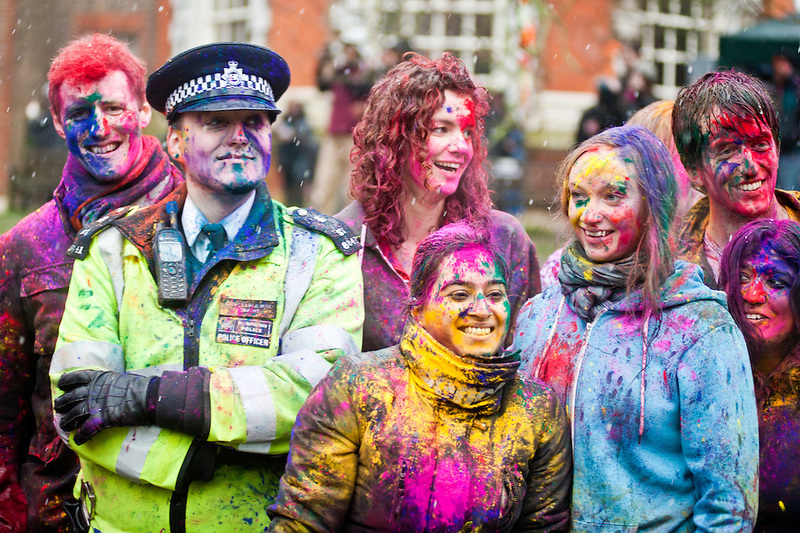 London, UK - 23 March 2013: a policeman poses for a picture with other partygoers during the Holi Spring Festival of Colour that takes place at Orleans House Gallery in Twickenham. The annual event marks the end of Winter and welcomes the joy of spring. Holy spring bhangra ok bollywood color colorful feast festival fun funny happiness india indian joy london orleans house party partying people person powder quirky richmond snow spring summer throwing traditional twickenham uk vibrant winter reportage photo reportage photo reporter features reportage photography reportage photographer documentary photographer documentary photography editorial reportage photographs photographs image images picture pictures photo photos project photoproject photo project photograph photographs event photographer event photography events photographer events photography event photographer london events photographer london press photographer london press photography london press photographer news photographer fotografo a milano fotografo milano fotografo milano centro fotografo lombardia fotografo "milan photographer" "photographer in milan" "photographer in bergamo" "photographer milan" "photographer milano" "photographer in milano" "italian photographer" "photographer in italy" "photographer in lombardy" "fotografo a como" "fotografo a pavia" "fotografo a bergamo" "fotografo a trieste" "photographer trieste" "fotografo di milano" "fotografo a milano" "photojournalist in milan" "corporate photographer" "event photographer" "fotografo di eventi" "fotografo di eventi milano" "photographer in bergamo" "photographer in trieste" "event photographer milan" "milan photographer"